A paradigmatic three stage approach to software development is sketched in terms of a torso-like, but schematic development of informal and formal descriptions (i) of the domain of sustainable development, (ii) of requirements to decision support software for developing models for and monitoring development (claimed to be sustainable), and (iii) of rudiments of a software architecture for such a system. 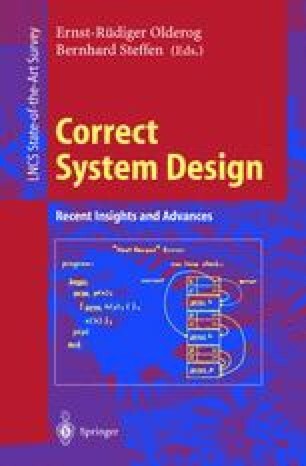 In “one bat we tackle three problems”: (i) illustrating a fundamental approach to separation of concerns in software development: From domain via requirements to software descriptions; (ii) contributing towards a theory of sustainable development: Bringing some precision to many terms fraught by “political correctness”; and (iii) providing, we believe, a proper way of relating geographic information system+demographic information system systems to decision support software. Perhaps a fourth result of this paper can be claimed: (iv) Showing, as we believe it does, the structural main parts of a proper presentation of software. I thank (i) participants in the February 1996 UNU/IIST Workshop on Software Technology for Agenda‘21: Decision Support Systems of Sustainable Development [35,36] for instigating the modelling effort of this paper and for kind remarks, (ii) my colleagues at UNU/IIST for enabling me to enjoy five stimulating years as first and founding UN director of that flourishing UN University software technology research and post-doctoral training centre in Macau, (iii) members of the IFIP WG2.2 and IFIP WG2.3 Working Groups for providing stimulating critique of my work, and (iv) Hans Langmaack for 20 years of close friendship. LI Xia and Anthony Gar-On YEH. A dss for sustainable land development in china using remote sensing and gis ­ a case study in dongguan. In , 1996. Centre for Urban Planning and Environmental Management + GIS/LIST Research Centre, University of Hong Kong, Pokfulam Road, Hong Kong; http://hdxugoy@hkucc.hku.hk.39.